"Wolf priest named Keldar kept silent during Wolves rebellion. Has resurfaced on Mars. Need to know why." Keldar, Archon Priest is an Archon of the House of Wolves. During the Wolves' rebellion against the Awoken, Keldar remained in hiding and refrained from aiding Skolas' scheme to become Kell of Kells. After Skolas' re-imprisonment and subsequent demise, however, Keldar reappeared on Mars, marshaling the surviving Wolves to worship the restored Orbiks Prime. Keldar can be found leading a Wolf Pack in the Rubicon Wastes. Keldar was second-in-command to Virixas, Kell of Wolves since Orbiks Servitors had permission over Kaliks Servitors. 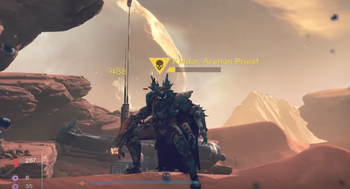 This may explain why a high profile target like him went into hiding during the Reef Wars whilst his counterpart Aksor, Archon Priest led crusades against the Reef that ultimately led to his capture. Since Keldar is a disciple of Orbiks Prime, it is likely he had a allegiance with Irxis, Wolf Baroness who had command over the Orbiks line of Servitors. Keldar is the only enemy boss that is killed on Patrol instead of their respective faction's questline. Despite being an Archon, Keldar appears with the normal wolf captain design instead of the Riksis or Aksor model.